How many countries are in the Olympics? There are currently 206 recognized Olympic Nations, represented by a National Olympic Committee (NOC) in each country. The International Olympic Committee (IOC) presides over the Olympic Games themselves, and the NOCs are divided between five continental associations (see map above). 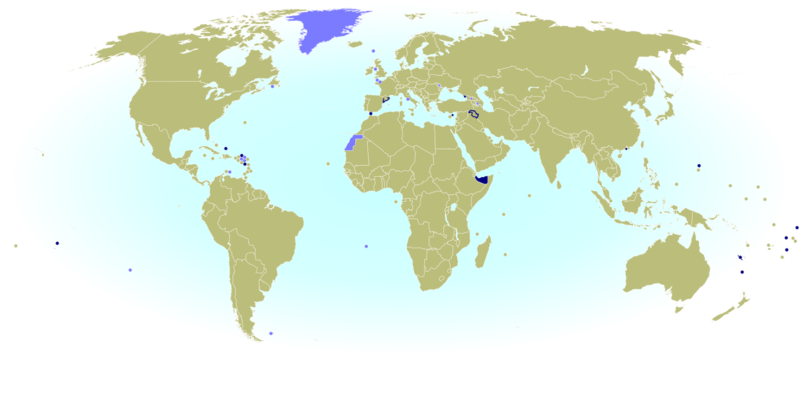 Click to enlarge: Dependent territories and partially recognized countries admitted to the Olympics. Taiwan - which is claimed by China but ruled as an independent country under a pre-Communist version of the Chinese constitution - was allowed to stay after the Communist government in Beijing took over representation of Mainland China in 1979. However, a compromise deal made at the time says Taiwan has to call itself "Chinese Taipei" in the games. Disputed Palestine, whose claimed territory is largely controlled by the military of Israel, was admitted in 1995 for the sake of athletes in Gaza and the West Bank, whose residents don't have Israeli citizenship. Palestine has since been recognized as a UN observer state, but at the time it had no UN status. However, it had already been recognized individually by about 100 of the world's countries (more than half of the UN's members). The third non-UN country in the Olympics, Kosovo, is a new addition. A separatist state that controversially declared independence from Serbia eight years ago, Kosovo has never been allowed into the UN due to objections from Serbia, Russia, and others. But the IOC decided to admit Kosovo as an Olympic Nation in 2014, after about 55% of UN member countries had recognized the breakaway state as independent. Which countries are new to the Olympics? There are two new Olympic Nations that have been approved since the last games: Kosovo, the disputed breakaway state mentioned above, and South Sudan, which became independent and joined the UN in 2011. At the time of the 2008 and 2014 Olympics, South Sudan's sports world wasn't organized enough to even apply to join the IOC, but it finally got things together and was approved as an Olympic Nation in summer of 2015. Although not an actual "nation", there will be one other new national-level team attending Rio 2016: the Refugee Olympic Team. This team was put together by the IOC in honor of the record-high number of people in the world who have been forced to leave their home countries to escape wars. Its 10 hand-selected athletes, all of whom are refugees themselves, will have their own place in the Parade of Nations at the opening ceremony. The last Olympic Games that had new countries were the 2008 Summer Olympics in Beijing, where the Marshall Islands, Montenegro, and Tuvalu were added to the list. There were no new Olympic Nations approved between then and the 2012 Summer Olympics in London, nor in time for the 2014 Winter Games in Sochi, Russia. Despite the inclusive and worldwide mission of the Olympic Games, not all applicant countries have been allowed in. In fact, one UN-recognized country still hasn't joined: UN observer Vatican City, the independent Catholic Church headquarters in Rome, has never applied. Which countries are attending the Rio 2016 Olympic Games? Being an Olympic Nation doesn't mean you have to actually send athletes to the Olympics every time. For example, many tropical countries choose to just skip the Winter Olympics altogether. But this year, all the Olympic Nations will have athletes participating in Rio...except one. Kuwait, which is in a drawn out dispute with the IOC over rules about government interference in sports, will not have an official team at the games. However, Kuwaiti athletes are being allowed to participate as "independent Olympic athletes", using the Olympic flag instead of the flag of Kuwait. That makes a total of 205 official Olympic Nations participating in the Rio 2016 games - a record high, since in London 2012 there were only 204 recognized Olympic nations in the world (and they all did attend). Add the independent Kuwaiti athletes and the new Refugee Olympic Team, and there will be a total of 207 delegations in the Parade of Nations tonight. The five associations are based closely on the world's continents, but with a few quirks: The Caucasus, Israel, and eastern Turkey are part of the European association despite geographers usually putting them in Asia; and the South American territory of French Guiana also falls under European jurisdiction, because it's considered part of France and doesn't have a separate team. "Chinese Taipei" is intended to be ambiguous, since most Taiwanese people consider themselves to be at least culturally Chinese. However, the use of "Taipei" is unfortunate for the two-thirds of Taiwan's people who don't live in or near the city of Taipei. This was especially awkward when the 2009 World Games (an Olympics-connected event) were held in Kaohsiung, Taiwan - something of a rival city to Taipei. Although Macau's NOC isn't recognized by the IOC itself, it has been accepted as a member of its continental organization, the Olympic Council of Asia. Macau participates in the Asian Games and Paralympic Games, but not in the regular Olympics. Seven dependent territories in Oceania are associate members of the Oceania National Olympic Committees. They're allowed to participate in some regionally-organized sporting events, but not in the Olympics.